When everyone was asked to build an Anderson Shelter, John Nutman (Jnr), Margaret Hayes nee Nutman and Mary Nutman his daughters are seen starting the hole at 3 Marine Crescent. 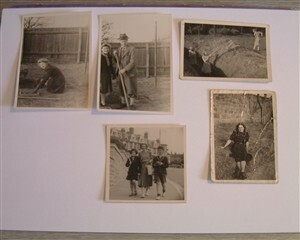 Also in this collage is Barbara (Babs) Nutman married to John's son, Duncan, and I think Jimmy and Gill the children with Nada Nutman, wife of Jack Nutman who was sadly missing presumed killed, during the war. Please correct me if I am wrong on this data. This page was added by Stuart Runniff Hayes on 23/05/2012.